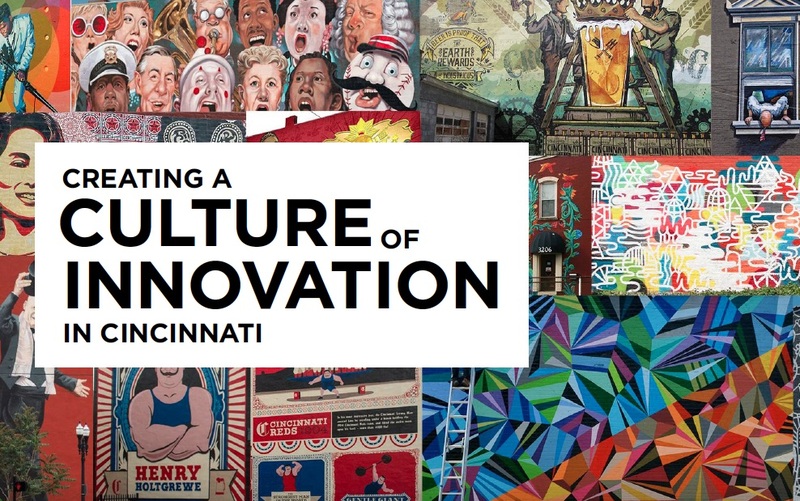 Cincinnati-based creators and ‘Creating a Culture of Innovation’ panelists Beth Silvers, Sam Korach and Sean C. Davis embrace the concept of a creative shift in how they work, live and create. As a content strategist, storyteller and member of Cintrifuse, Cincinnati’s tech startup support network, I value the open source inspiration that comes from working at a coworking space like Union Hall. 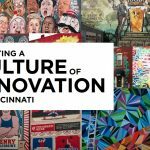 Comprised of two historic buildings in Cincinnati’s bustling Over-the-Rhine neighborhood, Union Hall is a Midwest hub for entrepreneurs, funders, tech startups and the businesses and creative professionals who support them. Union Hall is also home to numerous, high-tech meetups covering topics from cryptocurrency to IoT and coding to social media. The technical nature of these meetups is one of the reasons why I recently launched the event series Creating a Culture of Innovation. I want to complement these tech-leaning events with brainstorms, discussions, panels and presentations around creativity, design thinking, innovation and storytelling. The latest installment of the Creating a Culture of Innovation, titled Why You Need a Creative Shift to Ignite Growth and Innovation originates from my popular Fast Company story Why You Need a Creative Shift Instead of a Vacation, about filmmaker Joss Whedon reigniting his creativity in order to finish the superhero blockbuster The Avengers on time. 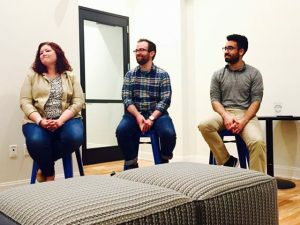 Cincinnati-based creators and series panelists Beth Silvers, Sam Korach and Sean C. Davis embrace the concept of a creative shift in how they work, live and create. It’s inspiring to watch them share their personal frameworks for how they implement a creative shift in support of their most important projects. It’s also gratifying to watch their conversations inspire our Union Hall audience. Sean C. Davis is an experienced developer embracing a creative shift via his interactive storytelling podcast Squirrel Stories. For Sean C. Davis, an experienced developer who’s worked at various agencies from Topic Design to Ample, embracing a creative shift helps him become a better listener. Plus, being a better listener helps him shift his work from CSS and HTML development to live music performances and podcasting via his interactive storytelling podcast Squirrel Stories. To be a successful developer, Davis shares with the crowd, you focus your skills in the areas of science and technology. To be a successful podcaster, you shift away from tech talents like coding and emphasize creative crafts like storytelling. As a disruption, innovation and startups consultant in EY’s Growth Markets sector, Sam Korach helps Fortune 100 corporations collaborate with startups and venture capitalists. His work at EY along with his two-year residency at Cintrifuse keep him digitally connected 24/7 with coworkers and customers. Yet, Korach is convinced that in order to have his best shot at successfully igniting a creative shift, he must make time to fully disconnect. No smart devices. No surfing the web. You need to experience discoveries and ideas offline as well as online in order to make a shift to new industries and sectors. By scheduling times for daily disconnects, Korach is bringing a creative shift to his very core. It’s more than a career move. He’s shifting how he works, lives and creates on a daily basis. Sure, Korach may be introducing his new storytelling blog digitally, but many of the blog’s ideas and topics come from his ‘disconnect’ time. Basically, it’s his embrace of a creative shift that allows him to be successful as a consultant versed in disruption and innovation. To continue growing her coaching consultancy along with her popoular podcasts Pantsuit Politics and The Nuanced Life, Beth Silvers draws upon her 11 year-stint working as an attorney and a human resources executive at a large, Midwestern law firm. To continue growing her coaching consultancy along with her popular podcasts Pantsuit Politics and The Nuanced Life, Beth Silvers draws upon her 11 year-stint working as an attorney and a human resources executive at a large, Midwestern law firm. Silvers powerfully symbolizes the creative shift as someone who moved from practicing law to becoming a storyteller via two popular podcasts and her consulting work. For Silvers, to ignite a creative shift; one needs to experience new insights. To help make that happen, one needs to embrace the unknown. Audience interaction starts the moment Silvers, Korach and Davis pause from sharing their experiences, projects and stories and listening to audience members talk about their career goals and creative work. Attendees reveal what they have in common with the panelists. They also point out what makes them different. As the conversations continue to unfold in a circular, fluid manner, the connectivity between Silvers, Korach and Davis and the audience increases. By the end of the discussion, people leave the first-floor room understanding how each other creates and works. Helping facilitate the discussion ignites my outlook on making a creative shift from journalism to chief storytelling services and content marketing. Listening to Silvers, Korach and Davis helps me strategize that a creative shift is not some finite moment with a specific beginning and end, but rather a series of chapters along a challenging and lengthy journey towards greater innovation. It’s a journey worth taking, and like all great journeys of discovery, it’s a lifelong learning experience. 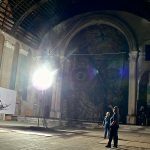 Read and Share 4 Action Steps From Panelists Beth Silvers, Sam Korach and Sean Davis on using a Creative Shift to activate your own projects. Listening to experienced developer Sean C. Davis describe his work at various agencies from Topic Design to Ample, one begins to see coding and software development as a linear broadcast; a delivery of content from the programmer to the customer. A successful developer is someone who broadcasts her or his work in a concise and compelling manner. In order to make a successful shift towards audible storytelling as a podcaster, Davis flips from a deliverer of content to a receiver of ideas, insights and stories. He listens and connects more powerfully with the people around him. Action Steps: Review every stage of your customer journey map and identify places to boost listening. Increase opportunities for colleague and customer feedback. Move reviews and revisions to earlier stages in your design and build projects. 2. Make Time to Disconnect. Creative professionals make customer accessibility a priority. It’s key to providing assurance that they will deliver high quality work on time and on budget. However, when it comes to embracing a creative shift; Sam Korach, an innovation and startups consultant in EY’s Growth Markets sector launching a new storytelling project; makes a point to disconnect daily from all screens and smart devices. For Korach, disconnecting delivers a time for deep ideation. These quiet moments of contemplation help him discover new industries for his services and igniting new skills. Action Steps: Efforts to discover white space frequently focus on customer markets. Are you building a not-in-market product or service? Can your product or service honestly claim proprietary tech? Disconnecting from your screens and smart devices on a consistent basis allows you to discover personal white space; those innovative areas, ideas and talents you have yet to ignite. Beth Silvers credits a willingness to embrace the unknown as the creative force driving her shift. Her desire to experience new insights and take risks help explain ending an 11 year-stint working as an attorney and a human resources executive at a large, Midwestern law firm to becoming a popular storyteller with her podcasts Pantsuit Politics and The Nuanced Life, along with a coaching consultancy. Action Steps: Implement risk taking into how you create, live and work. Embrace the unknown as a possible project outcome. You’re still delivering the high-quality content, product and service your customers are expecting. By embracing the unknown, you’re also delivering discovery as a value added. Steve Ramos Media is a content marketing studio and provider of storytelling services that help businesses make an impact and generate profits. Founder Steve Ramos is a writer and strategist experienced in the areas of business, culture, science and technology. He has also been published in Fast Company, NY Mag and QZ/Atlantic Media. 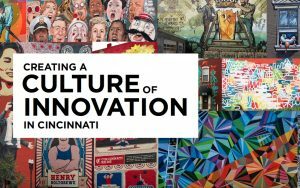 Look for the next Creating a Culture of Innovation experiences Fall 2018. ← A Hike on the Kalalau Trail Ignites my Spirit for Storytelling.